Peace was fleeting. Vorham Riddess, Venur of Esra Province, covets the crystal ore buried deep in Leland's mountains. His latest device to obtain it: land by marriage to a Leland maiden. But that's not all. In the midst of it all, Sela Redheart is lost, driven from her home with only her old uncle to watch over her. As the dragon-born child of Kallon, the leader of Leland's Dragon Council, she is trapped in human form with no understanding of how she transformed, or how to turn back. Wanderers seek a home, schemes begin to unfurl, and all is at risk as magic and murder, marriage and mystery strangle the heart of Esra. A struggle for power far older and deeper than anyone realizes will leave no human or dragon unaffected. "Our minds are as easily fooled as our eyes," Layce said. "Sometimes, what we're protecting is all on the inside." "She's a creature of the wilds, like her father. And his father. Just because she looks human doesn't mean her wanderings can be tamed out of her because they're inconvenient." 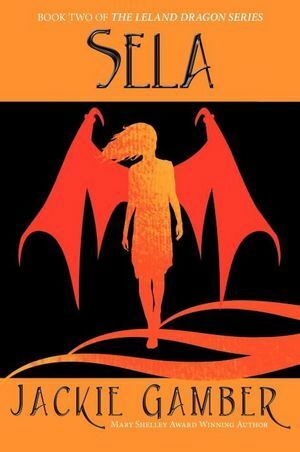 When asked by Seventh Star Press to participate in the blog tour for the second book in Jackie Gamber's Leland Dragon Series, Sela, I didn't think twice before immediately jumping on board with it. I have read and absolutely loved the first novel in the series, Redheart, and knew that I simply couldn't afford to miss the sequel. Having devoured and been totally blown-away by Redheart, I expected a lot from this book. I couldn't wait to be taken back to Leland, revisit the treacherous mountains, vast fields of green, and familiar villages. Most of all, I was anxious to be reunited with all my favourite characters, fly high in the sky with all the majestic, colorful dragons, and soak up the beauty and freshness of Gamber's world. I can't even begin to describe how happy this book made me - it's a breathtaking, magnificent fantasy book, so rich in atmosphere, so vibrant and emotionally engaging, so full of character, passion and magic - it's virtually impossible not to fell in love with it. 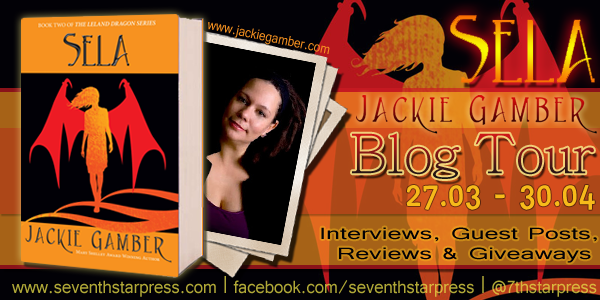 Once again Jackie Gamber delivers, and she does it with style, power and irresistible charm. I won't lie, I was a bit surprised when I first learned about Redheart not being a stand alone novel, but rather a first in a planned trilogy. Why? Because it ended so perfectly! I didn't see what could possibly be added to the story without making it seem forced and overdone. Jackie ended her first book in a way that was perfectly satisfying, sensible and seemingly final. The main story - Kallon and Riza's story - was concluded. Yes, the author left a small opening for a possible follow up (mainly because of Blacklaw's disappearance - and when a bad guy walks away, we all know that he's going to be back with a vicious revenge plan, and sooner rather than later), but I honestly didn't think it necessary to explore further what already seemed explored enough. So what does Gamber do? She does something utterly brilliant! She turns her trilogy into a saga, adding a whole new generation of characters, enriching the plot, making it even more twisty and intense, and - which is even more fantastic - she tells the whole thing from human's perspective, focusing mainly on Sela, her feelings and adventures. I loved it. I think I loved it even more than Redheart. It was just as thrilling and exciting as the first book, but, thanks to the clever mix of familiar (well-known characters, settings, mythology, political issues, etc) with brand new (new generation of characters, new threats and mysteries, shift in the narrative and many more), it turned out to be even more captivating, mesmerizing and utterly fantabulous. I was totally exhilarated to once again meet Orman Thistleby and Jastin Armitage - my two favorite Redheart's characters, but at the same time, I was just as happy to be introduced to a whole new palette of intriguing personalities. Jackie Gamber did a phenomenal job expanding the already wonderful world, and filling it up with even more fascinating protagonists. At the same time, even though there were many more characters to keep track of, I never had any problem following the story. Gamber dynamic prose is both easy to comprehend and quite rich in descriptions. She makes it easy for the reader to lose themselves in the story, and knows exactly which words to use to fuel their imagination. The resulting narrative is not only swift moving and flavourful, but also perfectly balanced. I really love Gamber's version of dragon world. Some may find it odd - after all these are dragons with social structures and politics, dragons who not only fly and breathe fire, but also paint, write chronicles, bake, etc - but to me this world is nothing short of pure delight. So fascinating and original! And I really enjoyed seeing it again, this time through Sela's eyes. Sela's character really brought this story to life, made it more complex and poignant, and added a whole new layer of emotions. I never expected this book to be so moving and thought-provoking, and it was! It's not just a gorgeously told fantasy, filled with mythical creatures and sparkly magic, it's - perhaps most of all - a wonderful coming of age story, a very interesting portrayal of family pulled apart by difficult circumstances, and a tale of young woman trying desperately to discover her identity. All in all, Jackie Gamber's Sela is an amazingly imaginative novel. Delicate, dramatic, and absolutely dazzling, it's a beautifully written tale of young girl discovering her place in the world, and one definitely worth picking up! For full blog tour schedule please click here! I haven't heard of these books before, but your review makes me definitely want to check them out. I was glad to read your review. I hadn't heard of this series before and I always enjoy a good dragon story. I'm going to be checking these books out, they sound fantastic. I haven't heard of this book before. And I never read about dragons so when I read this, and I will at some point because it sounds like a great read, it'll be something totally new to discover.